Webinar on Wed, July 12: Introducing hybrid preclinical PET/MRI for simultaneous molecular & functional imaging to your lab | Cubresa Inc. Contact us if you missed our webinar on Wednesday, July 12th where we described how Cubresa’s NuPET™ MR-compatible scanner and an existing MRI enable simultaneous preclinical hybrid imaging to better understand disease and to monitor novel treatments in small-animal models. 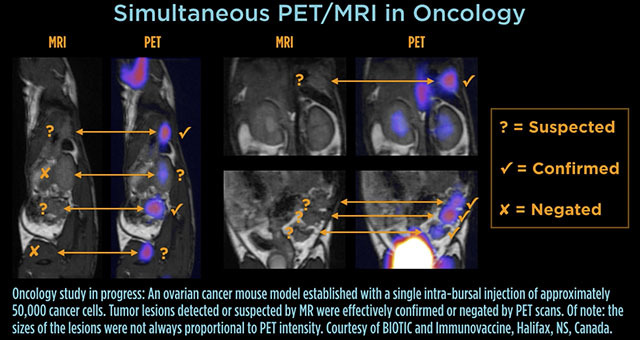 PET and MRI are highly complementary in vivo imaging modalities that can allow you to better understand the complex disease mechanisms at work within small-animal models. Oncology and cardiology experiments involve respiratory and cardiac motion, and in neuroscience, physiological changes within the brain can occur rapidly. Registration errors that occur when an animal is moved just a few feet from one scanning system to another are eliminated. Ask us about seeing a recording of this webinar to see and hear about the benefits of simultaneous PET/MRI and the capabilities of our NuPET scanner. This is a great opportunity for you to ask questions related to your particular application and about the NuPET scanner itself, since we will have our scientific and technical experts on hand.